North Carolina’s Wildlife Action Plan (NCWAP) is a comprehensive planning tool developed by the N.C. Wildlife Resources Commission to help conserve and enhance the state’s full array of fish and wildlife species and their habitats. It was developed in cooperation with numerous partners, including federal and state agencies, conservation organizations, and stakeholders. The Commission convened Taxa Teams of expert biologists statewide to to evaluate all species in the state to identify fish and wildlife species of greatest conservation need (SGCN) and other species for which there are knowledge gap or management concern priorities. Species identified under the Conservation Concern evaluation category are SGCN. Research priority species are identified under the Knowledge Gap category. Management priority species are identified under the Management Concern category. There are 457 SGCN listed in the NCWAP. This number includes amphibians, birds, crayfishes, freshwater fishes and mussels, mammals, reptiles, and terrestrial and aquatic snails evaluated by Wildlife Action Plan Taxa Teams of species experts. The SGCN also includes species evaluated by others and determined to be a priority for conservation, such as pollinators and other insects. The 2015 NCWAP describes 17 river basins and 40 types of aquatic, wetland, and terrestrial natural communities found across the state that provide important habitat to fish and wildlife. The plan matches each SGCN to the habitat type or river basin where it is found, identifies the most important threats facing each habitat, and details the priority conservation actions required to protect and conserve these species and habitats. This is the basic framework underlying North Carolina's Wildlife Action Plan. SGCN and other priority fish and wildlife can now be specifically targeted by carefully considering conservation or management options within essential habitats. The goal is to strategically target imperiled animals and their required habitats early, preventing them from becoming extinct. 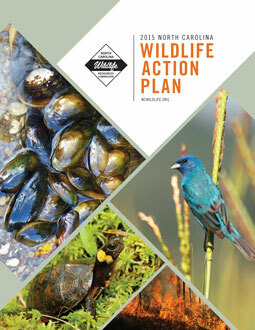 State Wildlife Action Plans (SWAPS) emerged from a mandate by the U.S. Congress that each state develop a comprehensive conservation strategy to be eligible for federal matching grants funded under the State Wildlife Grants program. All 50 states in the U.S. and several territories have developed their own SWAPs. Since submitting the state’s first plan in 2005, North Carolina has received an average $1.3 million annually to support implementation of the conservation actions laid out in the Plan. In large part these funds have been used to support the Commission’s Wildlife Diversity Program, which implements the WAP throughout North Carolina.